You want a cool book to give as a present? This is the one! 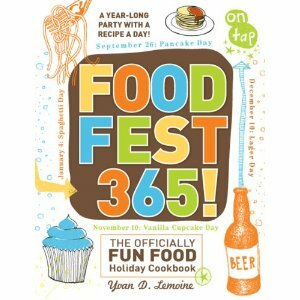 Food Fest 365 really is that: 365 food holidays each with a recipe to go with the day (scary is that they are technically real holidays, each one is approved by the President to commemorate that particular food….). But hey, who knew that February 11th is Peppermint Patty Day? Or that August 31st is Trail Mix Day? The book has lovely photos showcasing many of the recipes but what really stands out is the fun recipes – November 2nd for example is Deviled Egg Day which one might think “ooh, wow, deviled eggs” until you see how you soak the cooked eggs in beet juice! The eggs are purple-red on the outside, then white inside with the perfect creamy yellow yolk. How cool would that be for platters for New Years Eve? 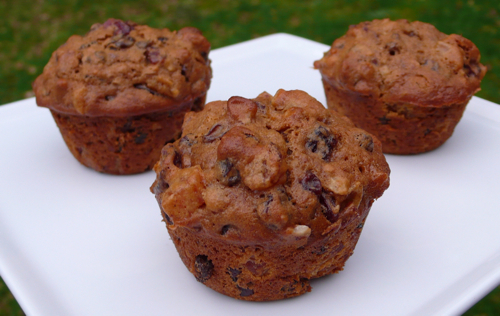 I was looking through December and decided to try December 27th’s, Fruitcake Day, which is 12 muffins. And nicely it doesn’t call for of the scary candied/dyed “fruits” (or worse citron…yuck). They turned out nice though Kirk commented he’d prefer them sweeter. While the recipe called for basting with liquor I didn’t (I rarely buy liquor, we are not big drinkers). Either way, it would be a neat addition to a desert table and could be baked in mini muffin tins as well. Preheat the oven to 350° and spray a non-stick 12 muffin tin with cooking spray. In the bowl of a stand mixer cream the butter with the sugar and salt. Beat the egg in. Sift the dry ingredients together in a small mixing bowl. Blend the buttermilk (or substitute) with the banana till smooth (I used a mini food processor) and set aside. Alternate adding the flour mixture and the milk mixture, beating continuously, until smooth. Add in the vanilla and molasses, follow with the fruit and nuts and mix again until smooth. Fill the tins all the way up with the batter (an ice cream scoop or disher works well). Bake for 15 minutes and check with a toothpick coming out clean. It took me 25 minutes, so if not done, keep checking every 5 minutes. Let cool for a few minutes and then pop out, on a cooling rack. – If using the liqueur upon coming out of the oven poke tiny holes in the muffins with a clean toothpick and baste each one with 1/2 tsp of the liqueur.